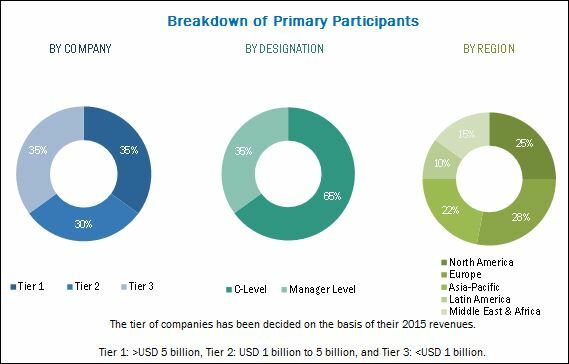 [201 Pages Report] The plasterboard market size is estimated to grow from USD 18.07 Billion in 2016 to USD 23.85 Billion by 2021, at a CAGR of 5.7% from 2016 to 2021. The base year considered for the study is 2015 and the market size is projected from 2016 to 2021. The report aims at estimating the market size and future growth potential of the plasterboard market across different segments such as type, form, end-use sector, and region. The other objectives include providing detailed information regarding the main factors influencing the growth of the market (drivers, restraints, opportunities, and industry-specific challenges). It also aims to study the individual growth trends, future prospects, and contribution of various segments to the total market. The study also analyzes opportunities in the market for stakeholders and details of competitive landscape for the market leaders. The study strategically profiles key players and comprehensively analyzes their core competencies. The plasterboard value chain includes glass manufacturers such as Armstrong World Industries Inc. (U.S.), Etex Group (Belgium), Saint-Gobain S.A. (France), Gypsum Management and Supply, Inc. (U.S.), USG Corporation (U.S.), Georgia Pacific LLC (U.S.), Boral Limited (Australia), KNAUF Gips KG (Germany), Fletcher Building Limited (New Zealand), LafargeHolcim Ltd. (Switzerland), and National Gypsum Company (U.S.). Other players in the plasterboard market include Mada Gypsum Company (Saudi Arabia), Beijing New Building Material Group (China), Gypsemna (UAE), Gyprock (Australia), Siniat Ltd (U.K.), Ayhaco Gypsum Products (UAE), Ahlstrom Corporation (Finland), Tai Shah Gypsum Co. (China), Yoshino Gypsum Co., Ltd. (Japan), Tanzania Gypsum Limited (Tanzania), Atiskan Gypsum Products Co Inc. (Turkey), Jason Plasterboard Co. Ltd. (China), and Gyptec Iberica (Portugal). MarketsandMarkets projects that the plasterboard market size will grow from USD 18.07 Billion in 2016 to USD 23.85 Billion by 2021, at an estimated CAGR of 5.7% between 2016 and 2021. The plasterboards market is expected to witness high growth as a result of the recovery of the global economy, high growth in the Asia-Pacific region, and the emergence of environment-friendly construction techniques. Growth in modern retailing, rise in consumer income & employment, and increase in demand for new construction projects are some of the other factors influencing the growth of the plasterboard market. This report is segmented on the basis of type, form, end-use sector, and region. The fire-resistant segment, by type, is projected to be the fastest-growing in the plasterboards market during the forecast period. The gradual shift of building contractors and consumers toward cost efficient, eco-friendly, and modern building techniques is creating growth opportunities for the plasterboard market. On the basis of form, the tapered-edged segment is projected to grow at a higher rate in the forecast period as it is easy and quick to install as compared to the square-edged plasterboard. Developed countries have a higher demand for tapered-edged plasterboard compared to that of developing countries. In 2015, the residential sector accounted for a larger share in the plasterboard market; this is projected to grow at a higher rate between 2016 and 2021. The growth of residential construction across the globe is also creating growth opportunities for the adoption of plasterboard. The residential segment is an emerging market for plasterboard products, where it is used for the construction of wall panels, ceilings, and partitions. 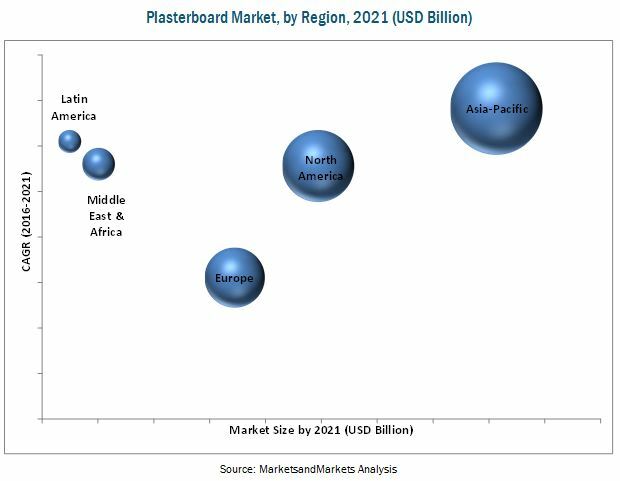 In 2015, the Asia-Pacific region accounted for the largest share and is projected to grow at the fastest rate in the plasterboards market from 2016 to 2021. Markets in developing countries such as China, India, Brazil, South Africa, and countries in the Middle East are projected to grow at a higher rate from 2016 to 2021, owing to the high population in these countries, along with expected new building constructions and renovation activities in the next ten years. Poor acceptance of plasterboard among the end-users due to pre-defined mindsets about plasterboard is a constraint in the growth of plasterboard market. Furthermore, lack of awareness about the recyclability of plasterboard among end-users is hindering the market growth. The global market for plasterboard is dominated by major players of the plasterboard industry, which include Armstrong World Industries Inc. (U.S.), Etex Group (Belgium), Saint-Gobain S.A. (France), Gypsum Management and Supply, Inc. (U.S.), USG Corporation (U.S.), Georgia Pacific LLC (U.S.), Boral Limited (Australia), KNAUF Gips KG (Germany), Fletcher Building Limited (New Zealand), LafargeHolcim Ltd. (Switzerland), and National Gypsum Company (U.S.). Other players in the plasterboard market include Mada Gypsum Company (Saudi Arabia), Beijing New Building Material Group (China), Gypsemna (UAE), Gyprock (Australia), Siniat Ltd (U.K.), Ayhaco Gypsum Products (UAE), Ahlstrom Corporation (Finland), Tai Shah Gypsum Co. (China), Yoshino Gypsum Co., Ltd. (Japan), Tanzania Gypsum Limited (Tanzania), Atiskan Gypsum Products Co Inc. (Turkey), Jason Plasterboard Co. Ltd. (China), and Gyptec Iberica (Portugal). These companies use various strategies such as mergers & acquisitions, expansions, new product launches, and partnerships, agreements, joint ventures, and collaborations to strengthen their position in the market. 11.2.1.4 Armstrong World Industries, Inc.
12.4 Armstrong World Industries, Inc.
12.7 Gypsum Management and Supply, Inc.
12.20 Yoshino Gypsum Co, Ltd.